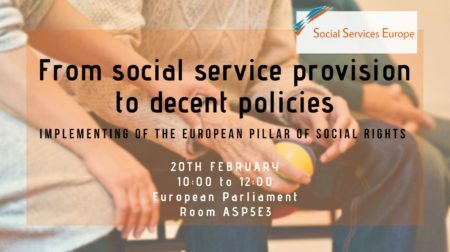 On Wednesday 20th of February from 10.00-12.00 at the European Parliament (room ASP5E3) Social Services Europe will present its most recent research study on Improving Work Life Balance (WLB) through enabling social services. This event is co-hosted by Mr David Casa, EPP Group MEP for Malta and Rapporteur of the Report on Work Life Balance for parents and carers. This research study is framed within the European Commission’s call for a WLB directive and showcases how social service providers are key to implement and ensure the right to suitable leave, flexible working arrangements and access to care services for parents and people with caring responsibilities (principle 9 of the European Pillar of Social Rights). The presentation of the research will be followed by a panel discussion based on Social Services Europe’s policy recommendations with input from Members of the European Parliament, the European Commission, Eurofound and COFACE. More details on the agenda below. If you wish to attend, please register here by Friday 15th February. EPR is currently hosting the Presidency of Social Services Europe for the period of six months.